One of my biggest goals for Cre8tion Crochet is to help other fellow crafters to find success. Whether it be teaching you how to make your crochet work professional and clean looking, learning how to start a business or a blog, determining how to price your crochet and how to sell for maximum profit or even just how to make beautiful items as a hobby. This page is where you will find links to all of my business articles. There are many more to come. The Selling Your Crochet series is designed for anyone who wants to start, or already owns, their own crochet business. Whether you are just starting out or need to improve sales for a business you already have, this is the guide for you. This series will be broken down into many parts. I will create action steps for you to follow to help you start and grow your crochet business. If any information you are looking for hasn’t been covered or you need more clarification on any subject please comment below and I will be sure to answer any questions you may have. 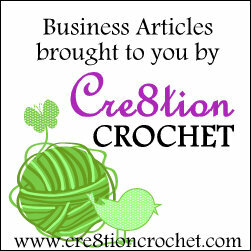 If you are interested in starting your own blog, stay tuned, the Owning Your Own Crochet Blog is coming next.